For Dinner: Braised Mocklach, a sea dish of Loki altered by the nanoprocessors to my taste. Mood: In need of a travel agent. Written in the Year of our Lord 3580, March 31st, Sunday night. I gave another sermon to Cynthia's little group, taking an example from Paul's travels, letting them know that I would be travelling. Cynthia came up afterwards. "Good luck. Where are you going first?" 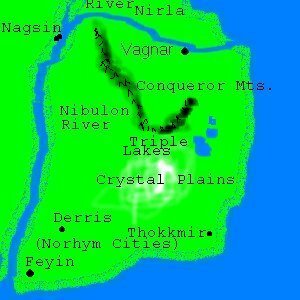 "See more of the continent of Laufey, first seeing the Nibulon river, I think." "The Conqueror Mountains are nice...rather like Earth's Alps were. I have gone skiing there. The Crystal Plains to the south are pretty unique...since there are more metals present on Loki, crystals form more readily. There are plains down to the South where crystal outcroppings form right on the ground, quite beautiful to fly over. Utterly worthless...and believe me, I've looked....but beautiful." "You think this trip is risky?" She shrugged. "Any trip on Loki is risky. But you are well guarded, you're important to the most powerful hierarchy...nation, basically...on the planet, you have the backing of the most powerful man in the Community Cluster, which beat Loki in the Loki-Cluster war...and I heard about your little kung fu fighting in the marketplace." "Uh oh. I don't think I'll ever be able to live that one down...."
"It's actually increased your standing with the Lokiites. Although they were, naturally enough, puzzled by why you didn't want the thieves killed." She paused. "Comparing you to Paul, in some ways, is not a bad comparison. He journeyed among the Gentiles trying to determine what they needed to receive God's grace..."
"And I'm travelling among the Lokiites trying to determine if they can receive God's grace? I dunno...comparing me to Paul is the kind of comparison that I know I can't live up to." "Best of luck, Father. We'll miss you. Maybe we can arrange some sort of video hook-up for a sermon next Sunday. Take care. Vaya con dios, and all that."